A determination to create original Art. A quest for beauty. A love of earth and clay. All led Dan Skinner to invent new ceramic techniques, innovative graceful forms, and sculptural realism that have become his trademark. His works include human and animal forms, as well as inanimate objects and large rare vases. Dan Skinner, master sculptor, recalls with exact vividness his initial foray into the world of sculpture and the wonder of creation. At the age of eight, Dan began what was to be his lifelong vocation. A simple lump of clay, meaningless to us, but to him the potential in this formless mass spoke to his soul. To the right, Queen Kaahumanu a Limited Edition Bronze Sculpture, completed in 1996 by Dan Skinner. 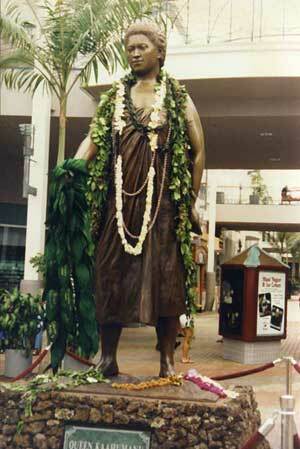 This bronze monument stands 8 feet high and is located in the Queen Kaahumanu Center Maui Hawaii. Similar to ancient man, Dan Skinner slowly, meticulously, hand builds pinch pots from a single lump of clay. Pinching, pressing and stretching, hour after hour, until the clay evolves and takes life. 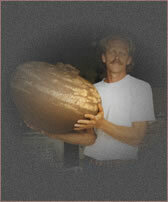 He creates exquisite art out of passion for clay, the primal medium, the connection to Mother Earth. large, aesthetic pots are masterfully sculpted into elegant works of art, each showing startling newness, melding a conscious rebirth of ancient techniques with bold, modern innovation. Making beautiful, distinct sculptures fires his passion, sustains the challenge and shows the genius of Dan Skinner artist and sculptor and his work. Dan has completed various commissions, done public artwork, and shown in galleries across the United States and now in Australia. Dan recalls his first sighting of a humpback whale ... from the jetty of the Ilikai Hotel in Waikiki, hawaii in 1969. "It was exciting, even from a distance. During seven years in alaska, he has hiked the cliffs of Cook Inlet's Turnagain Arm to watch numerous Beluga whales feast on local salmon. Orca whales frolicked off the bow of his boat while fishing in Prince William Sound. During summers in Southeastern Alaska, he viewed Bowheads, Greys,, Orcas, and Humpbacks. © Copyright 2005, 2006, 2007, 2008, 2009 Dan Skinner. All rights reserved.